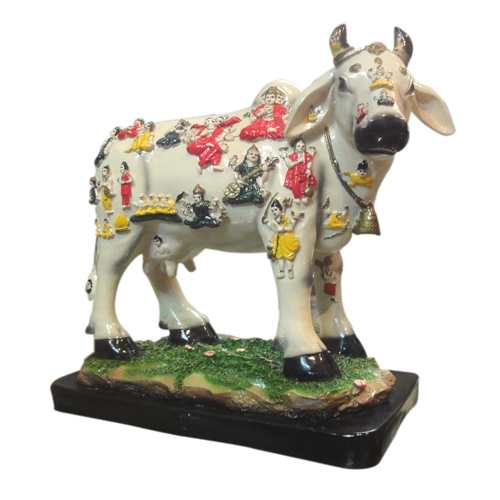 Kamdhenu Cow With Deities Dimension : L-12 x H-12 Inches Approx. Kamdhenu cow is the symbol of pro..
Dimension : L-12 x H-12 Inches Approx. 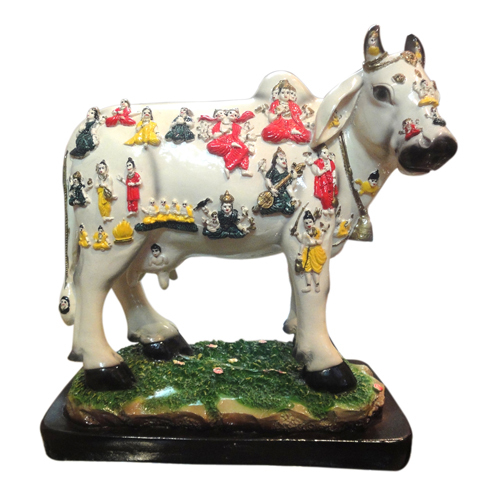 Kamdhenu cow is the symbol of prosperity and vatsalya (love that a mother feels for a child) and is considered highly auspicious for countering the vaastudoshas (architectural faults) & enhancing the overall good luck. The name Kamadhenu came from the Sanskrit root, "Kamaduha", which literally means, "the cow of plenty" and "the one through whom all desires are fulfilled".It is believed that each part of the kamdhenu cow embodies a particular deity & is worshipped as the divine wish-fulfilling cow goddess, according to Hindu mythology. This divine cow, which lives in swargalok (heaven), emerged from the ocean of milk (kshira-sagar) at the time of samudra-manthan (the great churning of the ocean by the gods (suras) and demons (asuras). It was presented to the seven sages by the Gods, and in course of time came into the possession of Sage Vasishta. It is believed that as Kalpa-vriksha, (heavenly tree) Kamadhenu, in the same way, fulfills the desires of those who approach it with pragya and devotion.Here, we would like to say that all such symbols/lucky charms are mediums only, never expect any miracle out of them. Only thing that matters is our bhava (your true feeling) toward God and such holy symbols. Such devotional figures/symbols should be kept /placed with complete faith. To get 100% spiritual benefits of this Holy cow, try to serve/save the street cow in your area/city, it is our firm belief that you will be definitely blessed with the real divinity. Marble Pooja Aarti Thali Swastik 7"